Domestic Entropy (DE) is a proposed unit for measuring the amount of disorder in a living space. Taking into account the number of occupants, facilities, and visitors, along with other measures of physical and psychological orderliness, this algorithm is an attempt to create an objective measure for what is otherwise a complex, nuanced, subjective experience. The output of the algorithm is between 0 and 1: 0 DE is complete order and 1 DE is complete disorder. 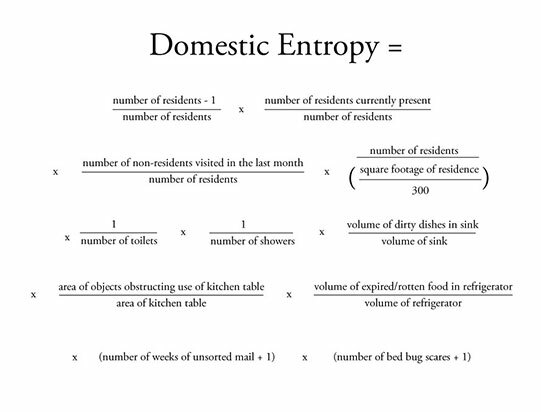 Use the Domestic Entropy calculator to determine the domestic entropy of your living space.